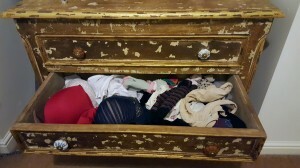 My perfectly tidy knicker drawer. Thanks Marie Kondo. At home, I’m not known for my exemplary tidying skills. I’ve read that creative people have a tendency towards clutter, which as excuses go is OK but my whole life has been spent searching for that THING I need. I was yearning for a solution to get tidy. 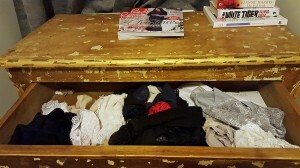 Enter Marie Kondo. She didn’t literally come to my home (although I’d love her to), no, it was enough to read an article all about ‘The Goddess of Folded Things’ in Red Magazine. The article shared Marie’s desire to calm the world starting with folded jumpers. An award winning author, Marie has just published Spark Joy, An Illustrated Master Class On The Art Of Organizing And Tidying Up. Really? 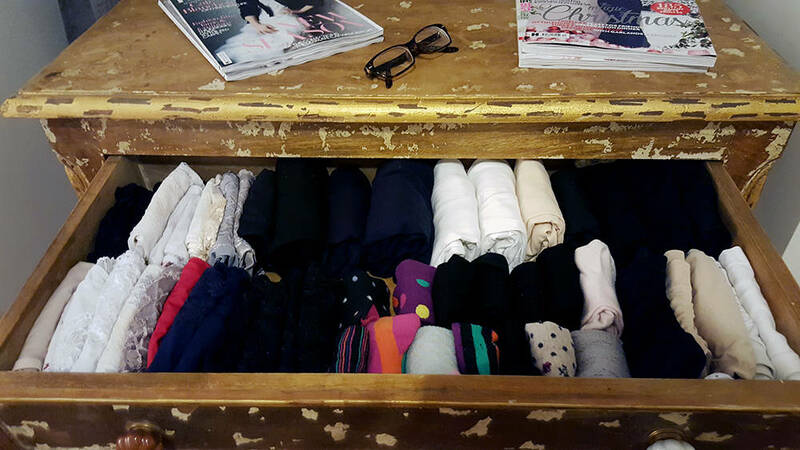 Marie is flying around the world demonstrating how to fold clothes and tidy up! And she is loved! With my usual lack of patience, I set about watching one of Marie’s YouTube videos, wondered if this was another ridiculous way of wasting time and then stared at my underwear in dismay. A dark, winter morning never starts well when rifling through an underwear drawer only to keep finding ‘summer size’ pants. I needed a system where I could easily find what I was looking for and not be reminded that I needed to lose a pound or twelve. Determined, I tipped everything out onto the bed, and sorted everything into sizes and colours. Sitting on the bed, it took about 30 minutes to fold everything out of the three drawers and replace them in an orderly style. Here’s the thing; repetitively folding pants, is just so calming, your mind just switches off! 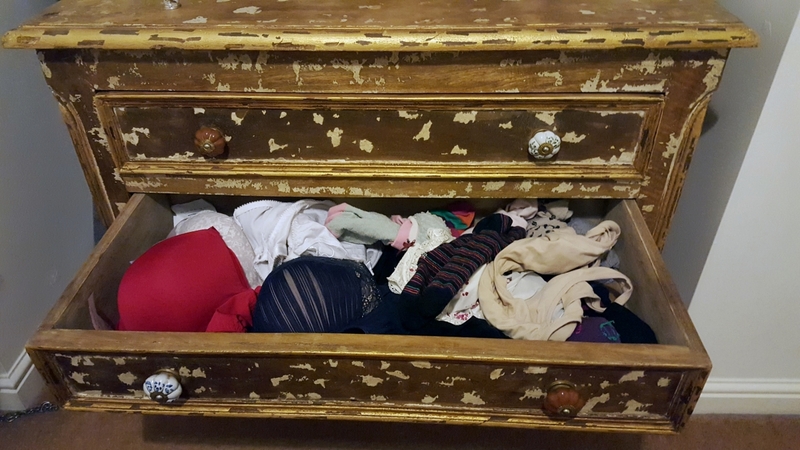 And the difference was incredible – I fitted the contents of three drawers into one! 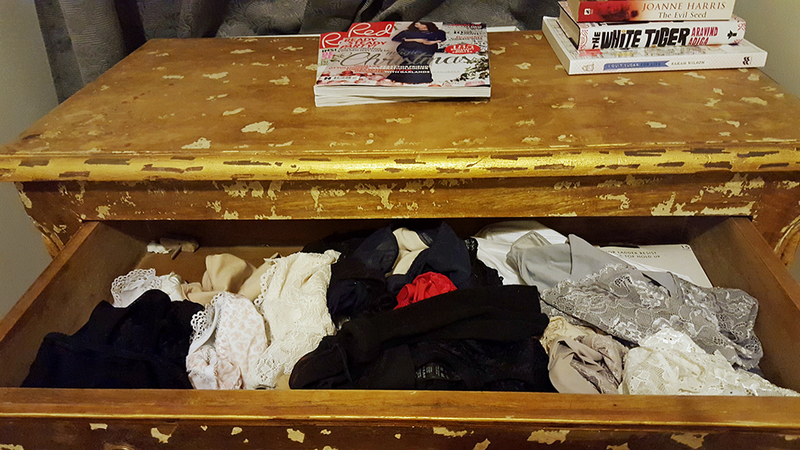 Because I created so much space, everything that had been piling up under the bed, now fit into the drawers. A small tidy realisation went off in my head and I spent the next two hours on a mission. The wardrobe was cleared out and returned all colour blocked, belts and bags are in my Grandad’s old suitcase, scarves have their own basket, towels are stored, the drawers in the office are sorted and I even folded all my tights! My tights! 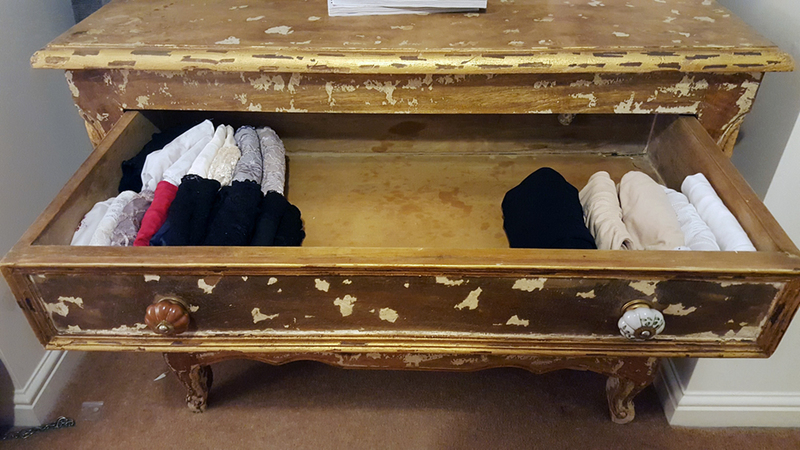 I started the Tidy-Up-Myself project on 13 January and amazingly, two weeks later, the drawers are still as neat as in the photos above. Every morning starts with a sense of peace because my things are easily accessible. Today, I stood ironing pillow cases and sheets for the bed. This has never happened in all my life. Something has changed. The fold-and-stay-calm revolution is quietly seeping into my brain. And it is very welcome. Next Post Pregnancy, childbirth and the happy ever after; not always! – Part two.